After running the gamut (thank$ to thi$ forum) from stock calipers and masters with all SS lines and HH pads to F4i/954/929 Fronts with a stock and a16mm radial master I found the magic combo, FOR ME, 2002 GSXR 6 pot calipers, with HH pads and fresh seals coupled with a refreshed 2002 GSXR 15.87mm master. I paired this combo with Galfer Wave Rotors for warpage and heat resistance. I tried the calipers with the stock master, uber powerful but soft feel due to the MC to caliper ratio. Will this combo be right for everyone? Doubt it, but it works for me and it all is direct bolt on with the exception of the fluid reservoir. I replaced the MC clamp with a mirror mount type handle bar clamp, solved that problem. The price was right, $100 for the master and calipers, $35 for the rebuild kits, $100 for HH pads. All the SS lines and banjo bolts fit in the TOKICO calipers and Nissin MC. I discovered during the brake trials how hydroscopic (moisture absorbing) brake fluid is. I've was never really concerned as I flush and replace mine annually. Whether you ride it or park it, it still absorbs moisture out of the air! I don't know how but it does. Particularly here by the ocean. The local performance brake manufactures (Porterfield) showed me a device used to measure the moisture content of the fluid. It's a simple two prong device the you stick in the fluid and it reads % of moisture. 0-3% safe, 4-6% marginal, anything over 6% should be replaced as the boiling point is lowered and the corrosion factor goes up. So, I bought one! Tested 11 bikes, dirt and street. Ranged from 1% on a freshly flushed system to a high of 18% on a 6 year old street bike with original fluid! The More You Know. https://www.otctools.com/products/br...d-tester-dot-3 (NOTE, only seen this in the name brand version of the tool, not the Chinese cheap ones... snake oil? might be, but DOT 3 , 4, 5.1 all have different wet boiling points so "good" or "Bad" is not a fixed number..
Last edited by E.Marquez; 10-20-2018 at 06:16 AM. Funny how brakes can be a journey. I went from stock to F4i to 600RR and 1000RR. My next step is vesrah RJL pads to replace the EBC HH pads. I have bigger fish to fry now but I like the 1000RR brakes the best. Too bad they are on my B bike that has the single sided swingarm & is too nice to ride often. Every so often I think of swapping the 2 front ends to get the better forks on the daily bike. Kinda a big job with limited space. And thanks guys now I cant see how I've been so blind as to no own the testing tool. Add that to the must have list...…. If your just doing DOT 4, get the OTC tool and be done with it...$35 or so street price and it does work. The cheap $10 or less ones claiming they test DOT3, 4, 23 the "Good" "bad" is BS as they are testing against a single standard and each fluid has a different wet boiling point. the % or moisture reading though should be accurate for all regular fluids.. the fly in the ointment... Is electrical resistance (what the pen type is reading) of the synthetic type DOt 3, 4, 5.1 the same as the non synthetic ...if no, what is the tester calibrated for???? 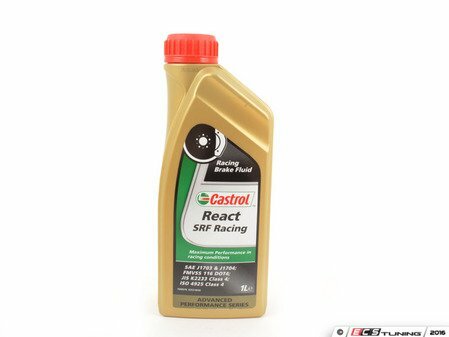 Have you seen this Castrol stuff for about $70 a bottle? Multi guys are all about it because the master is so close to the bread box. I'm fine with the Motul RBF600 cause it all gets flushed every spring. It's wet boil point is very high. The higher the boiling point the more hygroscopic (requiring more frequent replacement). ATE DOT 4 TYP 200 (198/280C boiling point) only lasts around half of what the ATE DOT 4 SL lasts (165/260C boiling point). That is what I found out for the car, anyway. For a bike I just don't see any reason to bother with high boiling point fluids- unless you weigh as much as the bike does and/or you have horrible technique (dragging the brakes) and/or there are some mechanical issues boiling/fading the brakes is very difficult, even with regular DOT4 fluid, and even on the track. il throw a curved ball in here. many years ago. well about ten or so when i was racing supermotos i was always having brake boil problems during the summer season and got a tip from an old wrinkly who said, try this stuff.. this stuff being hydrolastic suspension fluid that citroen used in there cars..
im not sure what that stuff was but i never boiled a brake system after that... as i say just a curved ball but it was bloody brilliant. Im not finding very little info that supports DOT 4 absorbs water at a higher rate. it is implied in a few things Ive read but no actual numbers, measurements. Leaving the reader to guess is "more" accurate by its so slight of a "more" it can only be measured in a laboratory so has no relevance in how we use the fluid or is it MORE and DOt type fluids absorbe 10 times as fast? 100 times as fast as DOT 3 glycol fluids? For a bike I just don't see any reason to bother with high boiling point fluids- unless you weigh as much as the bike does and/or you have horrible technique (dragging the brakes) and/or there are some mechanical issues boiling/fading the brakes is very difficult, even with regular DOT4 fluid, and even on the track. I could get away with wet DOT 3 on the street likely, but not on the track. For you perhaps clean DOT4 changed out every few years is all you require, if so, good for you..less money and maintenance time for you..Thats a good thing. For others, Id bet it is not... But to claim it is "un Needed" for all is simply not accurate. Last edited by E.Marquez; 10-21-2018 at 01:36 PM. Even this guys claim " For more extreme fluids such as RBF600 and RBF660, it is best to change the fluid more frequently to keep the performance benefits of these high temperature fluids. " . AKA- it degrades to crap QUICKLY. Studies are usually supported by the manufacturers, which wouldn't have any incentives in generating headlines such as "race brake fluid is much better than regular fluid... for the first months only" after publishing such studies. But to claim it is "un Needed" for all is simply not accurate. I never claimed that, but I'm willing to bet that 99% of riders, as long as they are not morbidly obese and/or riding in the desert heat and/or dragging the brakes (as many do, especially after fast straights), WILL NOT exceed the boiling points of standard DOT 4 fluid made by any reputable manufacturer on a bike with twin disk front brakes in good mechanical shape. Of course, proper brake bleeding is a must, and steel braided lines don't hurt either. And those 1% will surely not ask for advice on internet forums. I've heard the same thing about the higher boil point fluids. Mine gets flushed every spring like I mentioned so I have no worries. If your master cylinder is right beside a very hot catalytic converter, and you constantly loose brake pressure, you tend to seek a fix. That's what drove guys to find the highest number possible. Many of them say it resolved the issue too. I don't have a cat, or brake pressure issues. Quick Reply: Gimme' a Brake!